KLH Nominated for 2009 WI Manufacturer of the Year | KLH Industries Inc.
KLH Industries has been nominated as a 2009 Wisconsin Manufacturer of the Year (MOTY) in the small business category. Entering its 22nd year, the WI Manufacturer of the Year Awards program is co-sponsored by Baker Tilly Virchow Krause, LLP, Michael Best and Friedrich LLP, and Wisconsin Manufacturers & Commerce. Companies are categorized by number of employees: small, 1-99; medium, 100-299; large, 300-750; and mega, 751 or more. In addition to awarding a Grand Award for each employee count, the program will also recognize a company that demonstrates excellence in sustainable manufacturing practices. Measuring, planning, and preparing for growth is a primary focus of KLH's annual business plan. Not simply planning for growth, but for consistent, stable growth. As small business, KLH remained fully operational and even profitable in 2009. Utilizing custom-made information systems, KLH measures efficiency ratings to meet and exceed customer expectations. After all, if you can’t measure it, you can’t improve it. Continuous improvement is only possible with a workforce that embraces change. It’s not a company secret; KLH’s most valuable resource is the employees. KLH employees are encouraged to attend continuing education classes, both on the job and in the classroom. The average KLH employee received 102 hours of classroom training in 2009. Continuing education is expected of all employees, including the CEO, who logged over 150 hours in the classroom this past year. Controlled scrap collection allows KLH to recycle 100% of alloys and coolants. Employees are even encouraged to bring in non-functional and outdated electronics to ensure proper disposal. KLH will continue its "green" momentum into 2010 by installing a closed loop filtration system to each Waterjet, which will reduce water consumption by 90-98%. 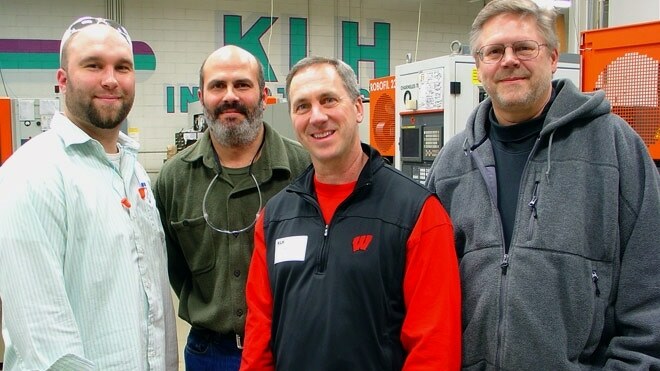 On Jan. 4, State of Wisconsin Representative Dan Knodl congratulated KLH on their recent nomination. Knodl (pictured above) met with several employees and management to discuss small business manufacturing in the area.